On Saturday night, we had a bit of an M&S disaster. It was late, we were pushing it, but we thought we would pop out for a bit of shopping before dinner. Weekends tend to be a bit, er, muddy, where the routine is concerned, and while I don’t like to blame my husband, I really do blame my husband. He is on a permanent passive-aggressive go-slow from Saturday morning until Sunday night and so things go a bit mental. My nicely cultivated week-long relaxed demeanour goes out the window when I am suddenly not in charge and I get a bit snarly and the children go a bit haywire and my husband just ignores us all and tries to sneakily read his book in various hiding places throughout the flat. Anyway, Saturday night. We had had one of the usual slightly strained days and we were out and Mark decided that NOW was the time to ditch Tiscali and get Sky. So he wandered up to the bored man at the Sky booth and said he would sign up. This process of course took about 40 minutes and so the rest of us just took off and went to M&S for the half-price champagne. At some point between the upstairs of Whiteleys and the downstairs of Whiteleys, all three of them went insane. So we go into M&S, filled with quiet, genteel and calm customers, and we head for the champagne rack and I grab three bottles. Noah squeezes out of the pushchair and runs around with Barnaby in a scary touching-everything kind of way. They are yelling and playfighting and customers are giving disapproving looks and swerving out of their way. I am stricken with a cold and so my voice does not go much above a very angry hissed whisper. Calling them back is no good, so I just charge ahead to the checkout and try to get out as soon as I can. At the checkout, Custard squirms out of his straps and stands up in the pushchair and starts grabbing for all of the chocolate and percy pig packets and squeals in an ungodly manner when he can’t reach. I am all very pregnant, holding three bottles of champagne precariously aloft, and the other two are yelling and running and wrestling each other to the ground. Then all goes silent. I turn around, and they are both peering into the big cardboard troughs of M&S chocolate christmas decorations – the ones wrapped in foil in mesh bags. I am uneasy, but am busy with shrieking Custard – trying to keep his grabby hands from tearing into a packet of sour worms. Then, I have a Terrible Mothery Intuitive Feeling. I march over to the chocolate trough, and catch both boys nibbling on broken slivers of christmas decorations from the mesh bags. STEALING! SHOP-LIFTING! BEING PROPER CRIMINALS! Their faces were a little bit smeared, and there was that lovely chocolately smell about them both. Two thoughts – do I march them up to the store detective to give them a huge fright, or do I get out of there as soon as possible and give them a bollicking all the way home? I give in to exhausted enertia. I yanked them up to the checkout, paid and got out of there as soon as I could. And OH! the bollicking was good and proper. I told them that if I ever caught them stealing again, I would take them to the police station, and that thieves had to go to jail and be separated from their mums and dads and the food was terrible. I was so angry and hormonal and tired I nearly cried, shaking all the way home. Thieves for children – how horrendous. So Sunday was less traumatic, thank goodness. The boys had a haircut at the very friendly Costas. They gave Custard a fake baby haircut so he wouldn’t feel left out – a quick sitdown in the barber’s chair, a cape, a spritz of the water, a pretend snip and a blowdry. He was very pleased. 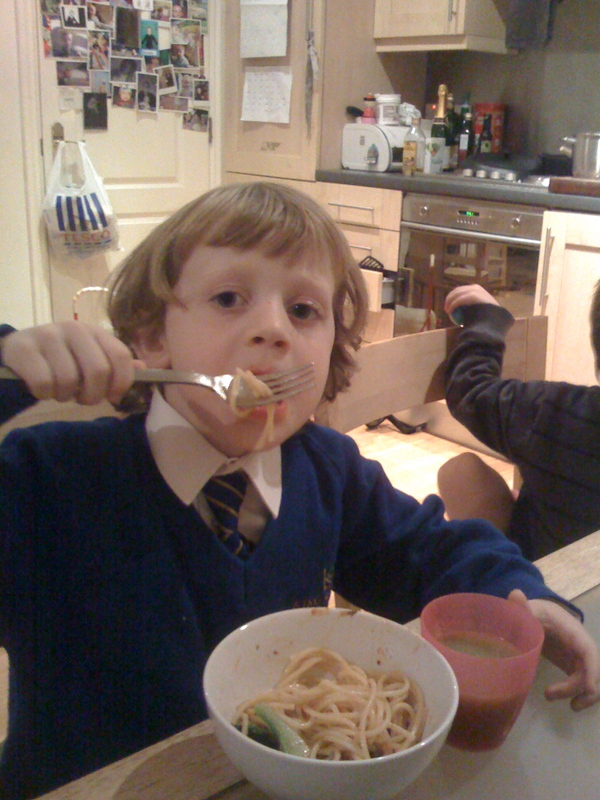 Then the boys had theirs done – a little less successfully, as Barnaby looked like Richard Chamberlain playing Richard the Third in a bad 70’s movie, and Noah got a barely perceptible (but there nonetheless) mullet. 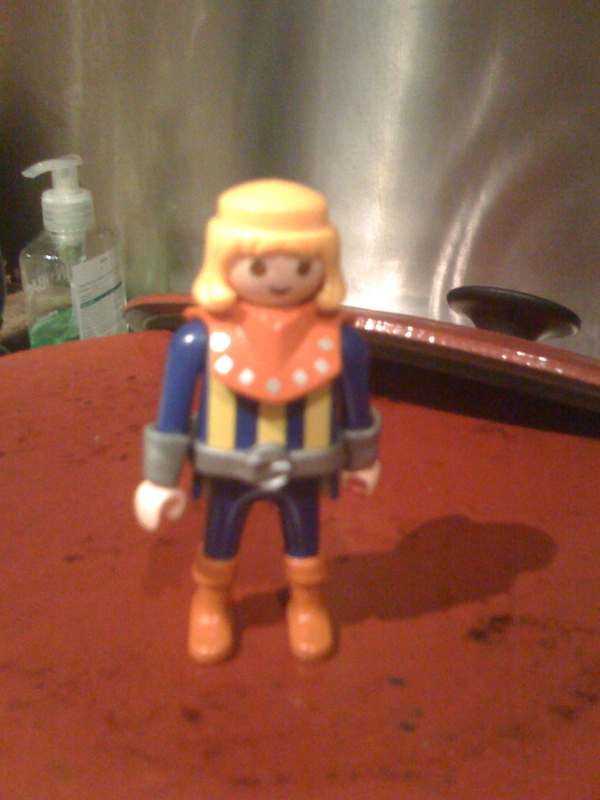 Uncanny how much he looks like his playmobil knight though, don’t you think? The girlies stole chocolate in a video store once. While my back was turned they ripped open a cream egg each and ate to their hearts content. I was extremely embarrassed. Paid for them and left. ARGHHHH! HA! that made me laugh. Awful, but very funny. Little ratbags. I just about wet myself laughing at your horrible moment… and the lego/hair comparison. At least these embarrasing moments make great blog posts! Hilarious!!!!! I can visualise the M and S experience so vividly. I hope Barnaby will not require counselling to recover from the trauma of his playmobile haircut. I had a most special pageboy cut as a child so can feel his pain. Mum, if you read this (she loves your blog too Jodi), how could you do that to me. I should also mention that Isabella once wee’ed in a very expensive duck potty in Mamas and Papas when I was looking the other way and so I had to buy the bloody thing.